Mike Chilson | Why Visual Studio Code? Home Blog General Programming Why Visual Studio Code? After navigating through using several other cross-platform editors over the last few years, my mind always kept going back to the best tool Microsoft ever conceived, Visual Studio. As most developers do working on multiple platforms, I started off on Sublime (which is an awesome tool but a bit clunky by today's standards IMHO) when there wasn't much more available. Then, when Atom came along I gave it a try, but it was painfully slow to work with on a daily basis. Of course, I also dabbled with using very barebone VIM and EMACS setups which were just not my preference. That’s the short version of my quest to pick my ideal tool for the job of writing code. As developers, we sometimes like to take the long route. I mean, it’s just an editor at the end of the day right? Ultimately, my dream was for Microsoft to make a cross-platform editing solution like VS for Linux and Mac. Well, guess what, it's here! What makes VSCode better than other editors in the same space? A well thought out and simply elegant interface. Developer friendly default settings make it ready to use "out of the box". Literally, THOUSANDS of extensions to "tweak" the editor to the languages you use. Hundreds of beautiful and well thought out themes and icon sets from other developers. "Out of the Box" Git Integration. IntelliSense - If you know it you get it, if not, you will love it. Also, of course, it’s cross-platform, free and open-source. It brings back features that get average use in a well-packaged, well-thought format. 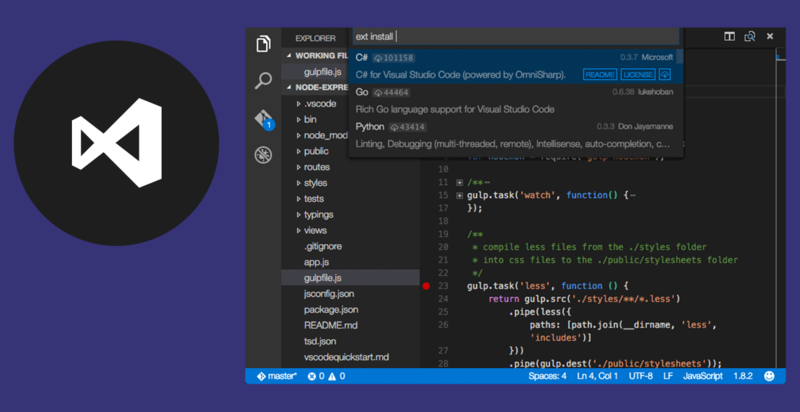 Give VSCode a try, even if you’re a die-hard Atom or Sublime fan. It might surprise you. It’s low-maintenance, just works and brings some cool features that you might like to use.